MOSCOW, May 11. /TASS/. 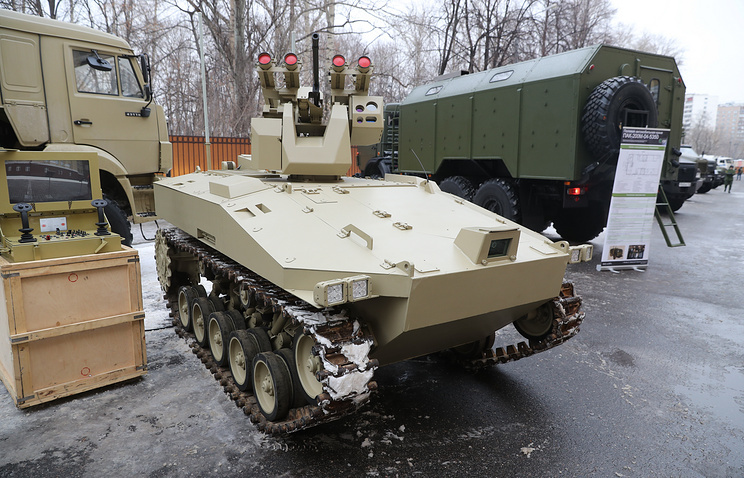 Russia’s newest reconnaissance and attack robot will be tested in 2018, the CEO of the Kalashnikov concern (an affiliate of Rostec), Aleksei Krivoruchko, told TASS. 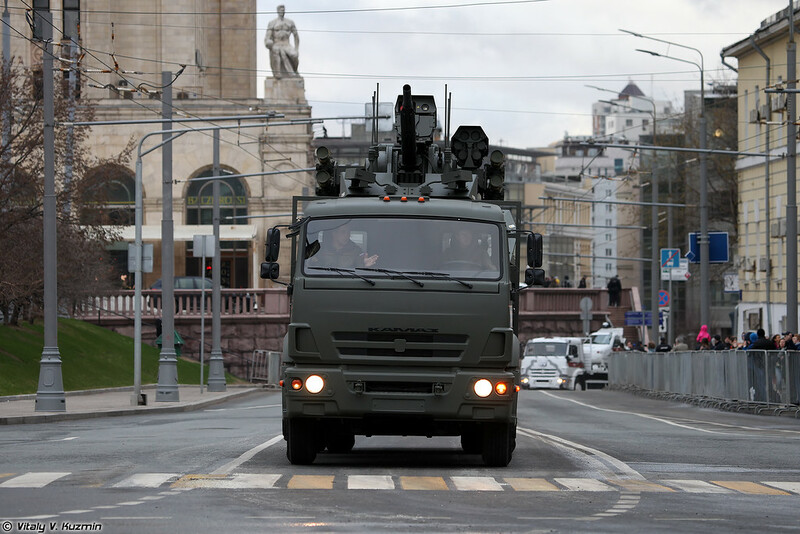 Earlier, he told TASS in an interview that the 20-tonne robot was in the phase of test runs. 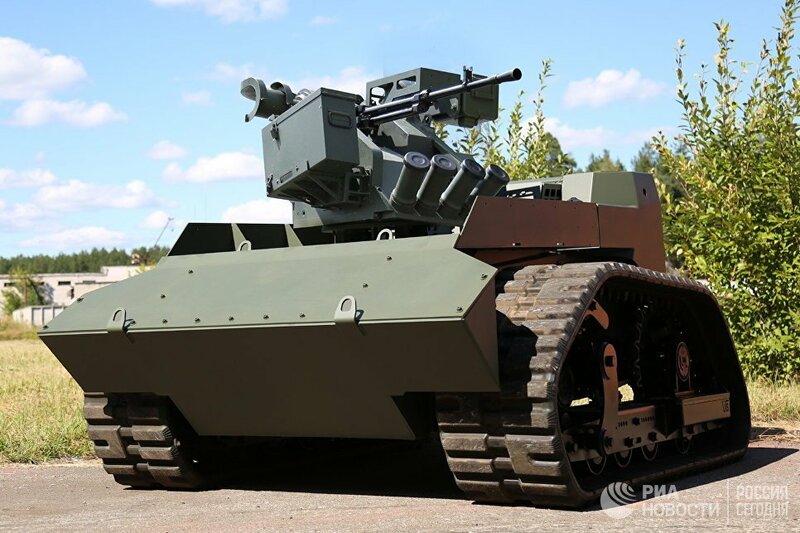 Kalashnikov last year demonstrated its first robotized system Soratnik developed at the request of the Defense Ministry. 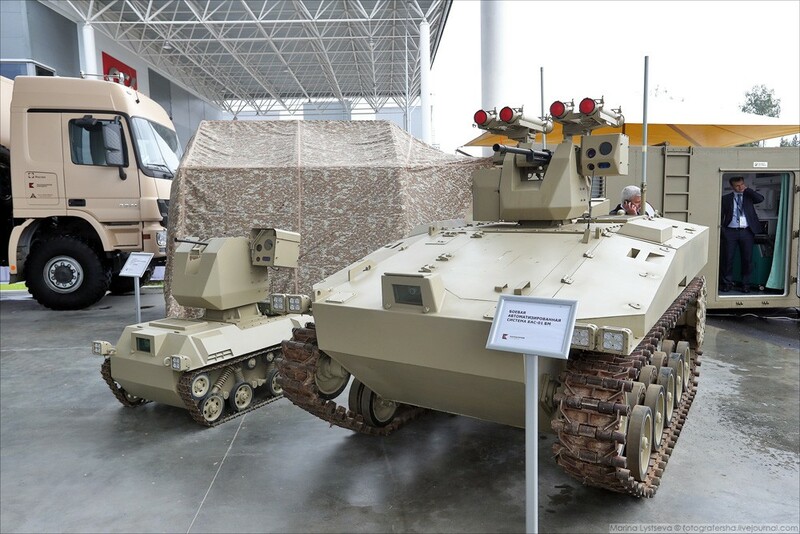 It is an armored tracked vehicle equipped with a computerized control system, encoded radio communication, target detection and monitoring equipment and a combat module. 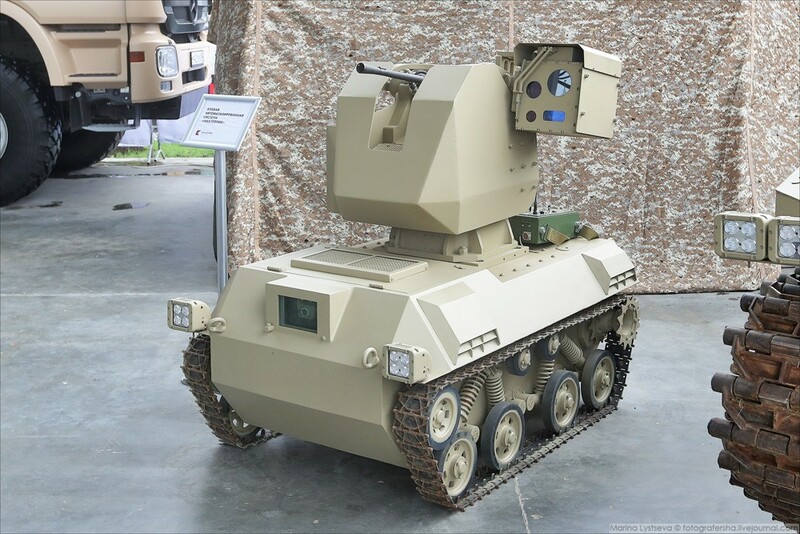 This robot is capable of interacting with other automated combat units, including Zala Aero drones. Can interact with drones too... that is interesting. Considering it is a vehicle platform I wonder if they ever considered going to water cooled barrels for machine guns again for the sustained fire role and thousands and thousands of rounds of ammo. This smaller vehicle clearly has the PKT heavy barrel version of the PK GPMG often fitted as a coaxial weapon on many manned armoured vehicles. Such a small vehicle would likely not be used for fire support missions, but I wonder about a fire support vehicle used to fight off perhaps enemy infantry attacks where sustained fire is needed. Water could be carried in large volumes, which could be used as drinking water for troops the vehicle supports in dry areas, but for sustained fire for machine guns and the like... the weight would not be an issue for a vehicle mounted weapon and not overheating would be useful for a vehicle as it would carry rather more ready to fire ammo than an infantry weapon could and therefore overheating becomes a real issue. Smaller one's job is to mop up anything that big one misses. 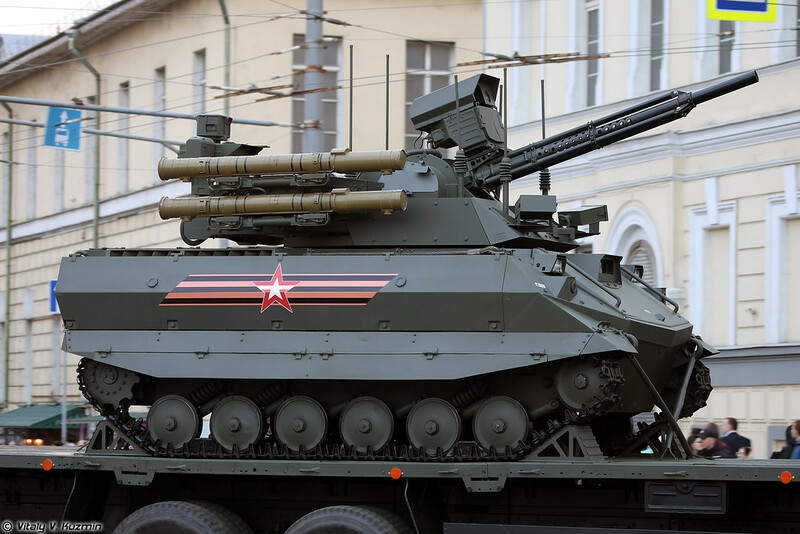 ANT1000R with Arbalet-DM "combat module"
You can even see that the gun mount is stabilized at the 0:46 mark. Neat stuff. Some of these robots seem to lack stabilization, maybe because of the cost. Typo there. 2x RPG-26, not RPG-29. 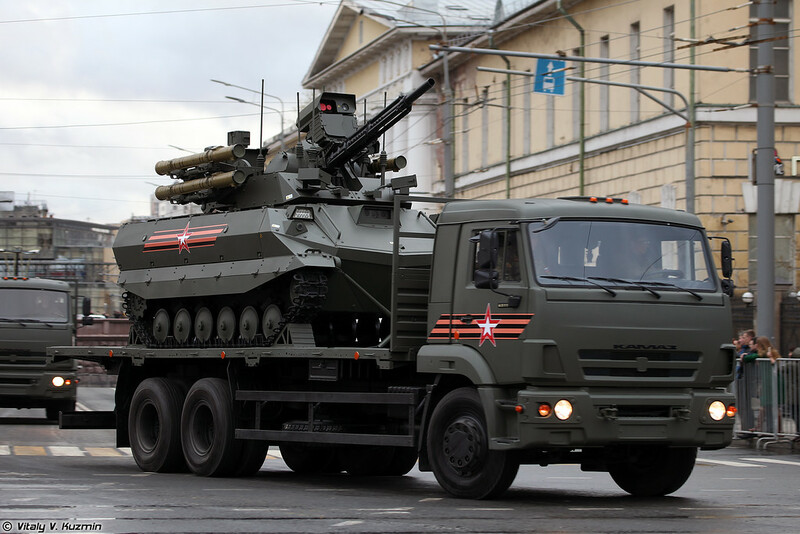 Certainly RPG-29 would be wrong as they are 105mm calibre reusable rocket launchers, but I suspect this vehicle would take the full range of disposable rocket launchers including RPG-28, which is actually more powerful than the RPG-29, though with shorter range. KUBINKA (Moscow Region), May 22. /TASS/. 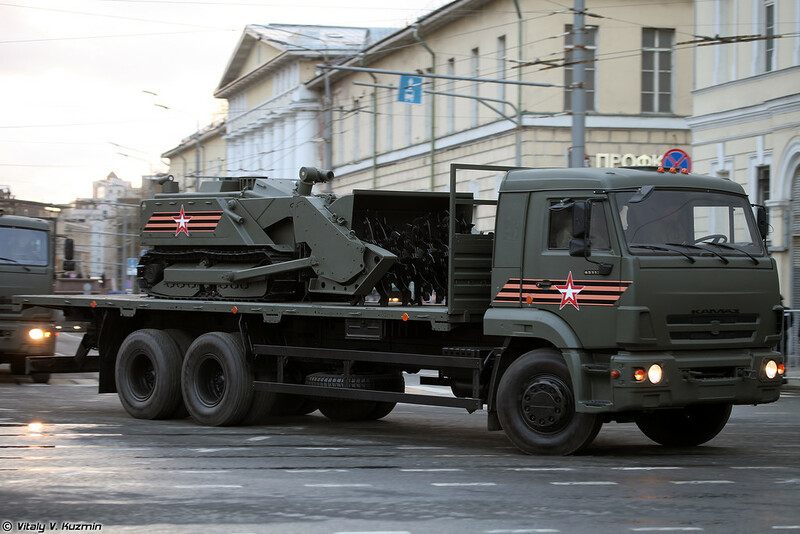 The robotic mine-clearing vehicles Uran-6, Skarabei and Sfera are expected to be accepted for service in Russia’s engineering troops this year, Chief of Russia’s Engineering Troops Lieutenant-General Yuri Stavitsky said on Tuesday. 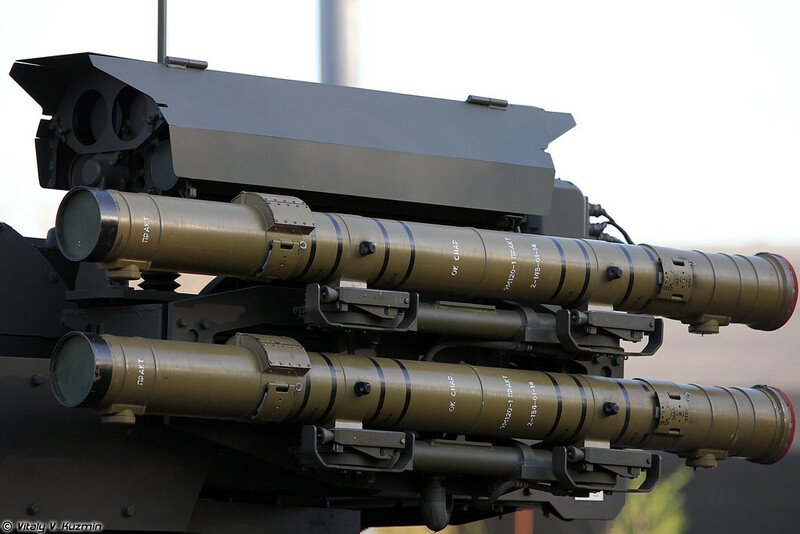 Does anyone know how many Uran-9s will eb purchased thoes things would come in handy during low intensity conflicts. Just watched quite a long video about some fighting in Syria where the camera and the Syrian army troops were based in the shell of a building and there was some open ground in front and then a wall and then a road and another wall and then beyond there was a concrete building that has large holes all over the place and the enemy were in that building... you could occasionally see them popping up and shooting. As I was watching this video I realised how valuable even a Nerehta would be with a belt fed 12.7mm HMG would be. This would be extremely useful technology... I am sure those soldiers who had to run out over open terrain would agree... and for the enemy to see a little hard target roll over that shot back at you personally when you fired at it... like it could actually see you... that would be scary as hell. Another bonus is that with a 12.7mm weapon it could actually shoot through the walls of the building the enemy was hiding in... so no longer cover... only concealment... which is never good enough in real war. Or shoot an RPO round rough one of the holes/windows. After that use the MG and finish the few survivors off. Did someone notice the rotary rocket launcher?